Caution Beware of moving vehicles symbol and text safety sign. Caution Fork lift trucks in operation symbol and text safety sign. Caution High voltage symbol and text safety sign. Danger Automatic machinery symbol and text safety sign. Fire exit arrow left symbol and text safety sign. 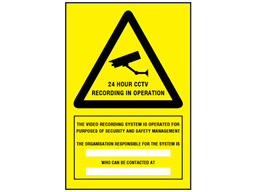 24 hour CCTV recording in operation sign. Panels to add the organisation operating the system with contact details. Part of our site security and premises management sign range. CCTV signs. 24 hour CCTV recording in operation. Panels for adding operating organisation and contact details. GS1570 Size 150mm x 100mm. Material self adhesive vinyl. GS1571 Size 150mm x 100mm. Material self adhesive vinyl (adhesive on face). GS1572 Size 150mm x 100mm. Material rigid plastic. GS1573 Size 300mm x 200mm. Material self adhesive vinyl. GS1575 Size 300mm x 200mm. Material rigid plastic. GS1576 Size 400mm x 300mm. Material self adhesive vinyl. GS1577 Size 400mm x 300mm. Material rigid plastic.